Today, cats are living longer than ever before thanks to better nutrition, indoor living and advances in veterinary medicine. Many cats now live into their late teens and even into their 20s, with some cats aging more gracefully and healthfully than others. Here’s what you need to know so your older kitty can enjoy his or her golden years with dignity. There isn’t a specific age that classifies a cat as senior. Like people, some cats age faster or slower than others. The American Association of Feline Practitioners (AAFP) and International Cat Care suggest these life-stage groups for older kitties: mature or middle-aged, 7 to 10 years; senior, 11 to 14 years; and geriatric, 15 years and older. The more common diseases seen in older cats include dental disease, arthritis, hyperthyroidism (aka overactive thyroid gland), kidney disease and diabetes. Since it can be challenging to tell if the changes you’re noticing in your senior cat are “normal” aging or signs of a more serious health problem, be sure to talk with your veterinarian. Don’t just chalk up changes in behavior or health to old age. Routine physical exams are essential to your cat’s health, and they become even more important as your kitty enters his or her middle-aged years. Like older people, older cats need to visit the veterinarian more frequently, usually about every six months — even if they appear healthy. Feline veterinary specialists also recommend blood tests be performed at least once a year to monitor for diabetes, hyperthyroidism and kidney disease. That’s because blood tests often detect evidence of age-related diseases before the condition becomes serious or signs are noticed by a pet owner. Early detection may mean greater success in managing or treating the disease, less discomfort or pain for your cat, and less expense for you. Use a litter box with low sides so it’s easy for your cat to get in and out. Keep litter boxes on the main level of your home — or place a box on each level — so your arthritic senior kitty doesn’t need to go up and down stairs. Increase the frequency of scooping and cleaning if your cat has become pickier about the litter box. The same goes for food and water bowls. These also need to be easily accessible and shouldn’t force your older cat to go up and down stairs. Older cats often need more warmth and padding to be comfortable. Consider layering soft blankets, towels or flannel sheets in favorite napping spots. You can also use an old sweater or sweatshirt to plump up your cat’s bed. If your senior kit-izen can’t jump onto his or her favorite windowsill, chair or sofa, make or buy pet steps or ramps that let your cat safely reach that special spot. The idea is to provide firm footing to avoid slips and falls. Finally, older cats may crave more attention from you than they did in their younger years. 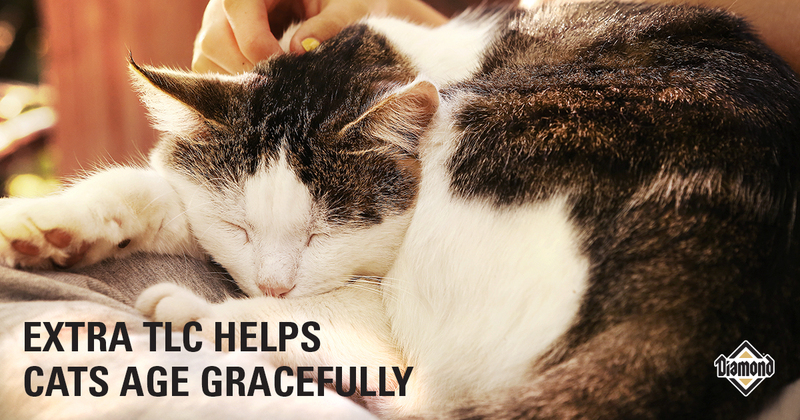 Petting, playing and grooming will all keep your cat purring, plus provide both physical and mental stimulation. You’ll benefit too, since spending time with a cat can lower your blood pressure, reduce stress levels and decrease anxiety and depression!